Woodland Art And Frame – We will be closed Saturday, September 1st in observance of Labor Day. Thank you for visiting Woodland Art and Frame! We have been serving The Woodlands, Spring, Conroe, and Oak Ridge for 37 years. 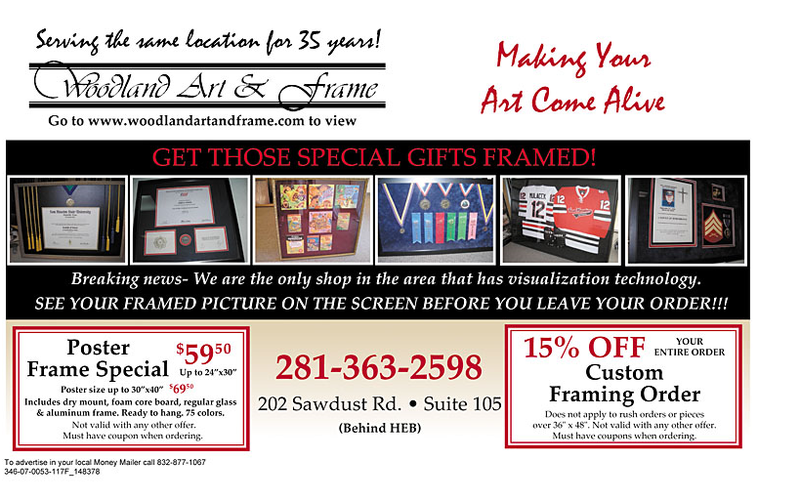 We would be happy to help you with all of your custom framing needs!!! Our Staff- 50 years of experience in custom framing!!! In the 1970’s, Dave’s mom owned an arts and crafts shop on FM 1960 named “Wishing Well Crafts.” She taught many classes in all sorts of art and there was a demand for custom framing. She farmed out the framing to an independent who framed from his home. Unfortunately, she almost got sued when her framer trimmed a valuable print of Dalhart Windberg’s. It was at this time that Dave was starting his teaching career and Mom asked him if he would learn the picture framing trade. Dave worked as an apprentice for no pay from Sherwood McCall who was the framer for Houston Art and Frame. Sherwood was a fabulous teacher who knew and still is a master of the art of picture framing. Dave left teaching and started the business, Kristen was born, and Cindy quit her job because she could not bear to be away from Kristen. There were very few customers at this brand new shop which is only four doors down from the present location of Woodland Art and Frame. Dave drove substitute bus routes for Conroe ISD with his Masters degree in teaching and after awhile, the business grew. Cindy soon began bringing baby Kristen and later baby Sarah to the shop with her and learned the trade rapidly. In 1986, Dave returned to band directing and has been in education to this day. Cindy took over the operation of Woodland Art & Frame and has run the business for nearly 37 years. Some incredible bonds have been made between our loyal customers and Cindy and Dave. Some of these customers have been with us for decades. The family now has hundreds and hundreds of members. Hugs are even abundant with life stories frequently exchanged between customer and framer and the rest is history!